The balancing act of moms goes further than just that because she also holds another title- wife. 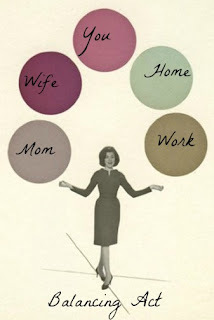 The job of "wife" has it's own responsibilities and juggling apart from being a mom, though no more or less important. This is your partner. The person who you want to spend forever with. They better rank pretty high up on that list of priorities. One thing that is important to think about is that you will be married to this man long after the kids have left. Do you want to be married to a stranger? I didn't think so. Things are a little different when you have little, little kids running around. They demand a lot of your time and your attention. I will be the first to admit, sometimes the husband gets lost in the shuffle. During those years, a text saying "I love you", holding hands while sitting on the couch, giving him compliments, and even leaving the dishes in the sink to spend 5 minutes of uninterrupted time with him will make a huge difference. I keep hearing about this thing called "date night". We have that. It's called Christmas shopping, Easter shopping, and occasionally our anniversary. And 2 of those events don't even involve us being together- just in the same store with separate lists. So here's the thing. "Date night" does not have to be going out. It can be cooking at home together and then watching a movie after the kids have gone to bed. The point is that date night is not that big of a deal- although I keep being told it is. Date night is just a extra treat when it actually happens. The big deal is that you are together. You are focused on each other. My husband and I have this system. It's called he goes and works 2 jobs and I stay at home and raise the kids. That means very little time together. Because one of those jobs is rotating shift work. For example- last week was 4-12 shift at his "main" job. So he gets up and leaves the house by 8 to go to one job, leaves there at 3 to go to the other job, gets off from that job at midnight, comes home, and goes to bed. The only time we see each other is the 30 minutes while he is getting ready. When I worked full time I didn't even see him then because I was already gone when he got up. SO that is one week every month gone. But we talk. All day. We text back and forth the entire time. We stay together even though we can't be together. We make it work. We are deliberate. Because that's what marriage is. A deliberate choice. You have to chose to make it work. We could go on and not talk or see each other that week, but we would suffer for it. So the key to balancing marriage among this thing called motherhood is to be deliberate! Put effort behind it. Sit next to him on the couch. Kiss him in front of the kids. Always tell him you love him. Hold his hand whenever you can. Send him a text everyday. Pray for him. Pray with him. Be deliberate with him.